THE READING ROOM: "Canada’s CBC News Shows What Thoughtful Breaking News Coverage Really Looks Like"
"Canada’s CBC News Shows What Thoughtful Breaking News Coverage Really Looks Like"
There's so much some of our news channels can learn from Canada's CBC News. As I watched via the network’s live stream in New York, I never heard a second of dramatic music, never saw a full-screen wipe with a catchy graphic like TERROR ON PARLIAMENT HILL, and never, ever heard [veteran anchor Peter] Mansbridge or any of the CBC’s reporters dip even a toe into the waters of self-promotion. Compare that to the American cable news networks, where we’ve come to expect that every prime time newscast will begin with urgent music and BREAKING NEWS–complete with multiple on-screen reminders that this is BREAKING NEWS of great importance. CBC’s coverage was, well, very Canadian. And to the nervous system of an American observer of TV news, it was decidedly strange to experience. 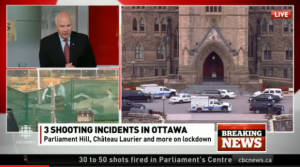 ALSO READ: "Canada's Coverage of the Ottawa Shootings Put American Cable News to Shame". There really is a lot news channels can learn from the CBC. Easwar [Shagorika's husband] and I have long thought so and it's good have our views endorsed! Seriously, though, it's a great public broadcaster, sane, balanced, and none of the shrill, hyperventilating that goes on in the name of news coverage on some channels. 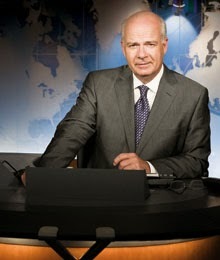 Peter Mansbridge, of course, is god in some circles. And so, of course, he has his detractors. Senior journalists who look down upon the fact that he is not a 'trained' journalist, not even a university grad. I guess they can't believe he's raking it in while others, supposedly more qualified, are unable to find his degree of success. There's an interesting back story, not sure if you know it, but have to share it with you. He was working as a ticket agent at the airport in Manitoba when he was pulled in to make on-air announcements because the man who was supposed to make them didn't show up. Someone from the CBC heard him and hired him on the spot for their radio service; Mansbridge was just 19. So I guess his gravitas was evident even back then! And another fun story. Rafi, Mahmood's son, [Mahmood Mustafa is also a former Khaleej Times journalist] is a huge fan of Mansbridge. When Rafi joined the CBC, everyone got to know how he hero-worshipped Mansbridge and for his wedding, his colleagues got Mansbridge to record a video message for Rafi. You should have seen Rafi's face when they played it. The hall, full of Mansbridge fans, erupted in loud applause. And such a sweet, personal message it was, too, from a national star for someone who was then a rookie. Quintessentially Canadian.